Of course adopting one of our homeless rabbits would be a great way to help. But there are also many other ways to help out the rabbits! Bunny Sage volunteers spread the word to the general public that rabbits make excellent indoor companions and provide assistance to the general public and Indiana HRS adopters answering questions about their personal rabbit(s). Bunny Helper volunteers provide assistance to move Indiana HRS foster rabbits into adoptive homes without having to house an Indiana HRS foster rabbit themselves. Bunny Bucks volunteers drive fundraising activities to further the Indiana HRS missions: education, adoption, and rescue. The Bunny Rescue Brigade volunteers provide hands on assistance to animal welfare advocates to rescue rabbits, whether they house a rescue rabbit in their home or not. Bunny Sage volunteers spread the word to the generation public that rabbits make excellent indoor companions and provide assistance to Indiana HRS adopters and the general public answering questions about their personal rabbit(s). Some Bunny Sage volunteer opportunities require no prior rabbit experience. This volunteer position is always on the lookout for Indiana HRS opportunities to educate the general public. Example opportunities include public events, animal welfare events, animal shelter events, pet store adoption events. This volunteer opportunity helps to spread the word to the general public that rabbits make excellent indoor companions. Bunny Buddies are paired with Bunny Guides and Bunny Experts (if available) at public events. If you would like to learn more about educating the general public, our Bunny Guides and Bunny Experts are great mentors! Age Ranges: Adolescent through Adult. This volunteer opportunity mentors Bunny Buddies by helping to spread the word to the general public that rabbits make excellent indoor companions and/or provides support to individual rabbit owners that have questions about their companion rabbits. Bunny Buddies are paired with Bunny Experts (if available) at public events. Age Ranges: Children (supervised) through Adult. This volunteer position is a formal opportunity to become a licensed Educator through House Rabbit Society, an International rabbit education and rescue organization (www.rabbit.org). A Bunny Guide volunteering for one year may apply to become a Bunny Expert. The best part of being a licensed educator, should you leave the area, your educator status travels with you! Bunny Helper volunteers provide assistance to move Indiana HRS foster rabbits into adoptive homes without having to house a rabbit themselves. This volunteer opportunity requires your time to travel to a foster home and spend time with a foster rabbit or foster rabbits. Rabbits are more adoptable when they interact with a wide cross-section of people/personalities. Each rabbit has different socialization needs and these needs will change over time! Thinking about adopting a rabbit? This is a great opportunity to learning about rabbits, get to know some of the wonderful Indiana HRS foster rabbits, and learn how to care for rabbits. You are guaranteed to walk away from this volunteer opportunity with a new appreciation for our rabbit companions. Reading a book to a foster rabbit is a great, non-threatening way to teach rabbits to trust. This is a great volunteer opportunity for children to improve their reading skills while helping out Indiana HRS foster rabbits. Adults are welcome to read to foster rabbits too ☺ This is a great service project opportunity for youth groups! The Indiana House Rabbit Society adoption program has a few steps. Bunny fact checker is the first step in the adoption process. For prospective adopters with existing animals, contact the prospective adopter’s veterinarian to complete a form documenting care for their existing pets. The completed form is forwarded to the Bunny Adoption Team, who makes the final decision to approve prospective adopters. Adult volunteers may need time during the day for a quick phone call to obtain the fax number for the veterinarian. Do you have an atypical work schedule? This is a great volunteer activity for you! The second step is Bunny Talk, aka talking to prospective adopters after they have submitted an adoption questionnaire. Volunteers are responsible for explaining the adoption process, getting to know the prospective adopter, obtaining clarification on submitted information, providing education on topics to increase awareness, and soliciting information for rabbit characteristics that are important to the prospective adopter. Your notes are forwarded to the Bunny Adoption Team, who makes the decision to approve prospective adopter. Adult volunteers will need availability evenings and weekends, when most prospective adopters are available. Bunny matchmaking is the third step in the adoption process. Interact with foster care providers and approved adopters to determine which foster rabbits match the approved adopter’s important characteristics. Your notes are forwarded to the Bunny Meet and Greet Organizer. Adult volunteers can perform this task when their schedule allows. Do you have an atypical work schedule? This is a great volunteer activity for you! The bunny meet and greet is the last step in the adoption process. Interact with the prospective adopter and foster care providers to arrange a time to meet rabbits and complete the adoption process. Adult volunteers can perform this task when their schedule allows. Do you have an atypical work schedule? This is a great volunteer activity for you! The bunny taxi driver transports an Indiana HRS foster rabbit from the foster care home to the veterinarian and/or from the veterinarian back to the foster home. This volunteer opportunity is extremely helpful to our foster parents who have busy professional lives, enabling a foster Mom or foster Dad to work a complete workday! Early morning Bunny Taxi Drivers need to be to the foster home between 730 and 800am for transport to the veterinarian. Late afternoon/early evening Bunny Bus Drivers need to be to the veterinary clinic before they close to pick up the foster rabbit and transport to the foster home, typical pickup between 430 and 530pm. The bunny taxi drivers may also be asked to transport fundraising items to veterinarians’ offices and/or sale locations. Do you have a flexible work schedule? This is a great volunteer activity for you! The bunny bus driver will pick up Indiana House Rabbit Society donations. This frequently occurs when a rabbit owner has lost a beloved family member. This is an occasional volunteer opportunity that requires a good listener with a big heart. It is a great opportunity for large sport utility vehicle and mini-van drivers! The Hay Sales Leader is responsible for initiating and coordinating this key fundraising initiative - selling hay to rabbit owners! Some key Hay Sales Leader responsibilities: transitioning the program from proof of concept phase to sustainable project, tracking sales and maintaining an adequate inventory of hay, coordinating Hay Driver and Hay Elf activities, and sending updates to Bunny Byte volunteers to remind supporters, thereby boosting sales. Do you have the vision to create this program and a penchant for managing project details? This is a great volunteer activity for you! The Hay Bulk Driver will drive to farm(s) to pick up hay. A vehicle with a capacity of 10+ bales is required and/or the ability to rent a vehicle with a capacity of 10+ bales in exchange for a donation receipt from Indiana HRS. The Hay Elf packages hay for sale. Hay Elves meet monthly on a weekend day. In exchange for your volunteer time, you will receive a 5 pound box of hay. The Hay Elf will be exposed to many bales of hay each volunteer shift. For volunteer safety, this volunteer opportunity may not be for you if you are slightly allergic to hay. This is a great service project opportunity for youth groups! The Packaged Driver will drive hay to distribution points as needed. This is a great volunteer opportunity for mini-van drivers! Bunny crafters are needed to create fundraising sale items. Are you creative? Bring your ideas to fundraising project meetings! Do you like to go with the flow? Please come and we will provide instructions for you to follow. The wood elf is needed to create fundraising sale items. Are you creative? Bring your ideas to fundraising project meetings! Do you like to go with the flow? Please come and we will provide a template for you to follow. The bunny sponsorship program lead is needed to design a program where all Indiana HRS foster rabbits, adoptable or sanctuary status, have at least one monthly sponsor. The bunny sponsorship program lead will work closely with the Indiana HRS intake and adoption teams and the Indiana HRS social media lead to provide program updates to solicit new sponsors, remind foster parents to provide periodic updates to existing sponsors, and inform sponsors when their rabbit has been adopted. The bunny sponsors make monthly donations to support an individual Indiana HRS foster rabbit or sanctuary rabbit. 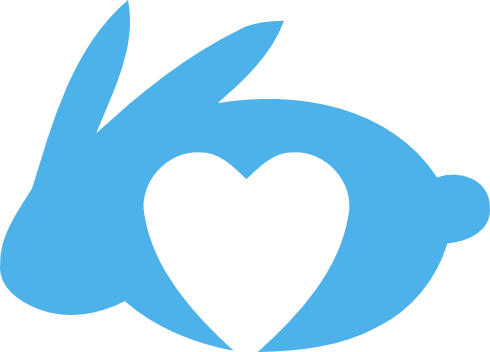 Sponsors will receive periodic updates on their sponsored rabbit, will be recognized on the website as the rabbit’s sponsor, and additional items as the program is developed. The Bunny Rescue Brigade volunteers provides hands on assistance to animal welfare advocates to rescue rabbits, whether they house a rescue rabbit in their home or not. The shelter liaison is Indiana HRS’ eyes and ears on the ground for your local shelter that accepts rabbits. Do you live near a shelter that does not accept rabbits? Indiana HRS can help! 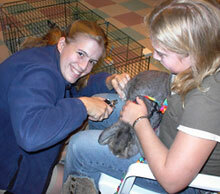 We can tailor the program for your level of rabbit experience and level of comfort providing education and in-service. Indiana HRS has training materials for shelter rabbit care as well as resources to provide rabbit adopters. Each foster care space enables Indiana HRS to save 2 rabbits – the rabbit pulled from a shelter and the space at the shelter that opens up to accept another rabbit. Indiana HRS provides supplies to set up the foster rabbit and pays for required veterinary care. Foster care provider provides pelleted food, hay, greens, litter, enrichment, socialization, and love. Your expenses may be tax deductible, consult your tax advisor. Indiana HRS can tailor the program to meet each foster care providers needs. The minimum time commitment is 2 months. If you want to foster a rabbit right now, please review and complete the foster application to get the process started. Due to no fault of their own, there are some rabbits that are not adopted. They are passed over by prospective adopters. Sanctuary rabbits will spend their remaining time with Indiana HRS. This can be for medical reasons, misunderstood rabbit behavior, age, or just plain dumb luck. Sanctuary foster care providers will provide care for a rabbit for the rest of the rabbit’s life. These rabbits are frequently housed just like they live in their forever home. Each sanctuary rabbit that moves from a foster care spot for an adoptive rabbit enables Indiana HRS to save 3 rabbits – the foster care space that opens up, the rabbit pulled from a shelter and the space at the shelter that opens up to accept another rabbit. Indiana HRS provides supplies to set up the foster rabbit and pays for medical care for the life of the rabbit. Foster care provider provides pelleted food, hay, greens, litter, enrichment, socialization, and love. Your expenses may be tax deductible, consult your tax advisor. Indiana HRS assistance is requested during rabbit confiscations. Volunteers frequently participate in triage, cage set up, medication administration, vet care transports, and daily shelter care for as long as the rabbits remain in the shelter. As these rabbits are part of active court cases, volunteer discretion is required. Training is provided. Please contact Indiana HRS to be placed on the confiscated rabbit shelter care team. This is the toughest work, but it is the most fulfilling as rabbits move onto other rescue groups and adoptive homes. The rabbit rescue van driver transports rabbit(s) from one shelter to another. The transport can be intra-state or inter-state. The transport could be because a confiscation of a large number of rabbits that overwhelms one market or because there are too many intakes and rabbits would be euthanized. The transport can be a single rabbit to dozens of rabbits. This requires a time investment and a well-maintained vehicle or access to a well-maintained vehicle. Indiana HRS will provide a donation receipt for tax purposes. The bunny email king or queen will take a one-month shift answering the info@indianahrs.org email address. Email messages will be triaged to teams as appropriate and/or answered using provided templates. This is an excellent volunteer opportunity for Bunny Buddies, Buddy Guides, or Bunny Experts. The bunny artist creates graphic design content to support Indiana House Rabbit Society special events, website, newsletter and social media content. The Indiana HRS social media lead will provide a steady source of information to post on social media. The social media lead will identify information to post and receive information sources from the social media content experts, research the accuracy of the information, and approve for post. If you love spreading rabbit education, rescue, success stories on social media, this volunteer opportunity is for you! The Indiana HRS website content expert identifies opportunities to contribute content to further the Indiana HRS education , rescue, and adoption missions. This volunteer provides content to the Indiana HRS Education Director. This can be a one-time content submission or repeated content submissions. We are incredibly grateful for all additions to the website! The Indiana HRS Facebook content expert will post approved content to the Indiana HRS Facebook page and closed Facebook group. Identify information sources and provide to the Indiana HRS social media lead. If you love spreading rabbit education, rescue, success stories on social media, this volunteer opportunity is for you! The Indiana HRS Twitter content expert will post approved content to the @indianahrs. Identify information sources and provide to the Indiana HRS social media lead. If you love spreading rabbit education, rescue, success stories on social media, this volunteer opportunity is for you! The Indiana HRS Instagram content expert will post approved content to the @indianahouserabbitsociety. Identify information sources and provide to the Indiana HRS social media lead. If you love spreading rabbit education, rescue, success stories on social media, this volunteer opportunity is for you! The Indiana HRS Snapchat content expert will post approved content to the upcoming Snapchat account. Identify information sources and provide to the Indiana HRS social media lead. If you love spreading rabbit education, rescue, success stories on social media, this volunteer opportunity is for you! The Indiana HRS MyStory content expert will post approved content to the upcoming MyStory account. Identify information sources and provide to the Indiana HRS social media lead. If you love spreading rabbit education, rescue, success stories on social media, this volunteer opportunity is for you! The Indiana HRS MailChimp master will manage email communication with IHRS supporters and adopters. This will include, but is not limited to, eNewsletters, fundraising campaigns, and monthly updates. MailChimp experience is not necessary, training is provided. The Parsley Post newsletter lead will build a newsletter template, network with IHRS volunteers to establish content sections, solicit volunteers to provide content, build a schedule, and manage deadlines. The goal is to publish the Parsley Post quarterly, starting small and growing the newsletter as content warrants. If project management is your forte, you are a great fit for this volunteer opportunity! The Parsley Post newsletter editor will accept contributed content, edit, and publish the newsletter. This volunteer will work closely with the Indiana HRS MailChimp Master. The Indiana HRS Parsley Post Newsletter Contributor identifies opportunities to contribute content to further the Indiana HRS education mission. This volunteer provides content to the Parsley Post Newsletter Lead for publication in the Parsley Post. This can be a one-time content submission or Parsley Post Newsletter contributions!